Nuby Milk Powder Dispenser | Pink | Easy and convinient . 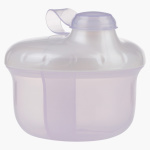 Store your baby's milk powder conveniently by getting this attractive milk powder dispenser. With an apt size and make, this dispenser is easy to carry and keeps the milk powder damp free.